Back in 2007, Microsoft came up with a coffee-table shaped computer, now known as PixelSense, which is affordable only to businesses. That concept is finally made into an affordable consumer product, the Horizon, by Lenovo, and running on touch-friendly Windows 8. Some of us experienced the product during the Windows 8 launch in Oct 2012, and from this month, officially for retail sale in Singapore. With a huge 27-inch display, you probably should not look at it as “just another touchscreen computer”. 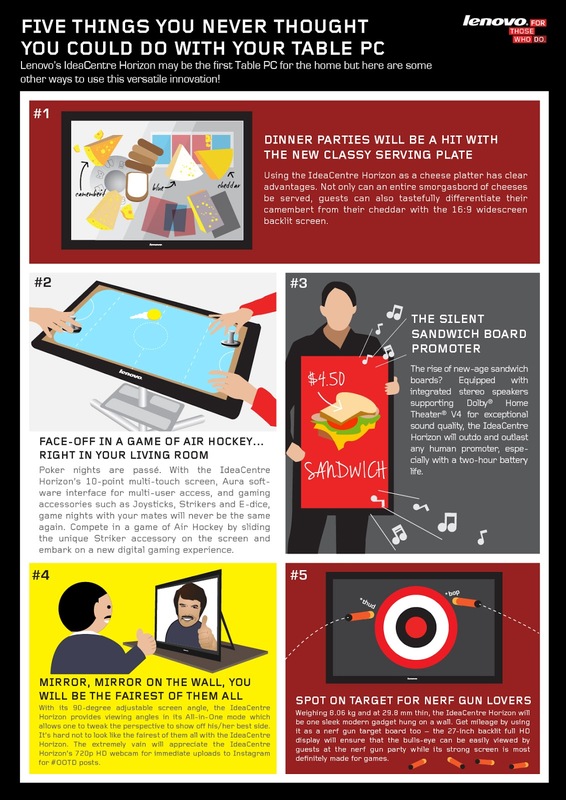 So Lenovo came up with the below infographic to spur your imagination. While some ideas might sound silly, I have a few ideas if I were to get one for my home. 1. Coffee-table Replacement. With the money I save on a coffee table, I can afford the Horizon. 2. TV Replacement. Whether you have a small family or you live in a single room, a standalone TV set can become a white elephant if you only use it for the occasional channel surfing. A laptop is too small and the desktop is too restrained. The Horizon is a perfect option: multi-functional and multi-purpose. 3. Promotes Interaction. TV does not promote family interaction. The Horizon does. And it allows you to use either the usual monitor position or flat on the table. Most importantly, it has a built-in battery which means you can bring it anywhere around the house to use it, and no longer restricted to near power points or a limited space. What other great ideas do you have that make use of the Lenovo Horizon?